Dan Harper is Associate Minister of Religious Education at the Unitarian Universalist Church of Palo Alto. He is also Camp Director for Ecojustice Camp in Palo Alto. Pat Wynne’s book, “Singing Out and Fighting Back,” is now in the American Folk Life Archive at the Library of Congress in Washington, DC. This book contain 12 performance pieces Pat wrote for the San Francisco Labor Heritage Rockin’ Solidarity Chorus. The book was designed and assembled over 3 semesters by students in the Computer Design Department at City College of San Francisco. The book contains approximately 80 songs, many arranged for 4 part harmony. Also in the Archive is Pat’s CD, “Singing is Believing,” and a DVD of “The Great Migration,” Pat’s performance piece, as performed by the Rockin’ Solidarity Chorus. This entry was posted in News on August 1, 2014 by Dan Harper. 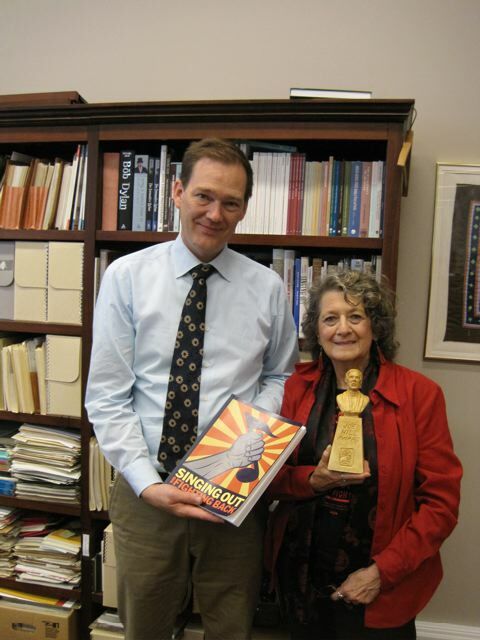 The Joe Hill Award was awarded to Pat Wynne, director of the San Francisco Labor Chorus, on June 21, 2014 by the Labor Heritage Foundation in Washington, DC. The Joe Hill Award honors artists who have contributed to the successful integration of arts and culture in the labor movement. It is given every year at the Great Labor Arts Exchange to persons based on their dedication, participation and promotion of labor, labor arts, culture, organizing and/or history. Other to have received this award are Pete Seeger, Cesar Chavez, Utah Phillips, Jon Fromer, etc. This entry was posted in News on June 22, 2014 by Dan Harper. The San Francisco Rockin’ Solidarity Labor Chorus will be singing a short set at the Berkeley Senior Center on Wednesday, May 28, at 1:00 p.m. Come on down, and join in the fun! This entry was posted in News on May 16, 2014 by Dan Harper. Don’t miss your chance to see The Great Migration and Motown — a show by the San Francisco Rockin’ Solidarity Labor Heritage Chorus that tells the story of mid-twentieth century African American workers. The multiracial Rockin’ Solidarity Chorus tells that story in words and song. Chorus members recount their own migration narratives, and the text also draws on Isobel Wilkerson’s The Warmth of Other Suns and some incisive analysis by Michael Moore. Musically, the repertoire includes (among much else) Civil Rights anthems, a Memphis Minnie blues, songs by the Bay Area’s own Jon Fromer, and some reworkings of classics from Motown, a record label built by children of the migration. This entry was posted in News on May 13, 2014 by Dan Harper. The San Francisco Rockin Solidarity Labor Heritage Chorus has a new show — Movement Energy: History of May Day and the Eight Hour Day! The original Labor Day was May 1, not the first Monday in September, in commemoration of the Haymarket Massacre in Chicago in 1886. Through spirited songs and the words of the participants, we tell the story of the movement for the eight hour work day which led to this massacre but did not stop there. Come see the premiere of this new show! This entry was posted in News on May 7, 2014 by Dan Harper. The Labor Heritage Foundation will present this year’s Joe Hill Award to Pat Wynne, director of the San Francisco Labor Heritage Chorus. The most prestigious award in the field of labor culture, the Joe Hill Award is given in honor of lifetime achievement. Previous recipients include Cesar Chavez in 1993, and Pete Seeger in 1995. Pat will receive the award at the Great Labor Arts Exchange in Washington, D.C., June 20-22, 2014. We just received permission from the Labor Heritage Foundation to release this exciting news! This entry was posted in News on February 28, 2014 by Dan Harper. Join the Labor Chorus and others for a Pete Seeger Commemorative Sing-along and Jam Session on Saturday, March 8, 2014, at the Unitarian Universalist Church of Palo Alto, beginning at 6:00 p.m.
— Where Have All the Flowers Gone? Song sheets for the above songs will be provided! Come ready to sing or to listen. If you’ve got one, bring your banjo, guitar, autoharp, ukulele, what have-you. Bring your copy of “Rise Up Singing” (we’ll have extra copies, too). If you have a song you want to share, bring 20-25 song sheets with lyrics and chords. We’ll order out for pizza, for those who are hungry! This entry was posted in News on February 27, 2014 by Dan Harper.